Educational programs and tours may be scheduled for any age group and are tailored to address the interests and developmental needs of participants. The Art Museum regularly provides tours for pre-school, K-12, college, and special education classes, as well community groups. Curricular materials and lesson plans that accompany each exhibition are available. These materials provide teachers and other educators with activities and assignment to help engage groups before, during and after a museum visit. For more information or to schedule a educational program/tour contact Katie Christensen, at (307) 766-3496 or katie.christensen@uwyo.edu or Heather Bender at (307) 766-3515 or hbender1@uwyo.edu. 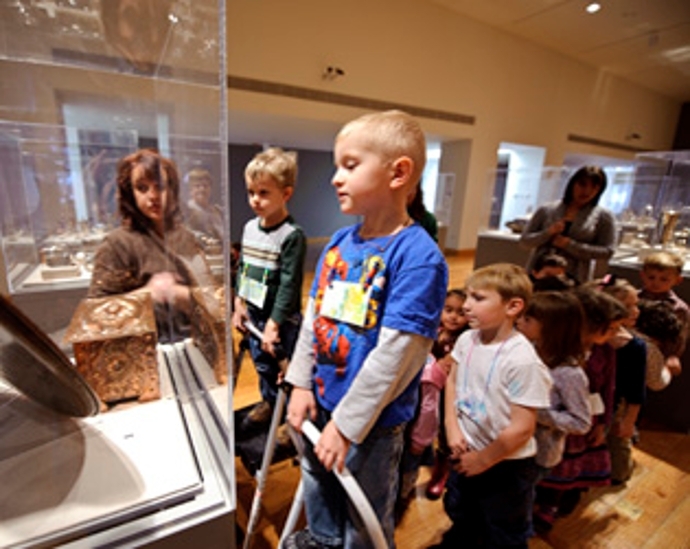 Museum tours help preschool through kindergarten aged students develop discovery and exploratory skills. Each visit is tailored to the age and developmental needs of the students. Learning basic concepts like line, color, shape and sorting prepares children for reading and pre-math. Creative art making processes, like those provided in the Shelton Studio, develop important fine and gross motor skills. As part of their tour, children also engage in serious play and discussion that stimulates cognitive development. Additionally, a visit to the museum allows students to interact with other children and adults and to learn accepted behavior in public community settings. Many preschools choose to make regular visits to the museum and the Shelton Studio, working closely with the master teacher to design sequential activities that build student development. The Museum Tour Program provides K – 12 students and teachers with essential learning experiences, utilizing original artwork as the focal point for art and interdisciplinary investigations. Under the guidance of a master teacher, students view and discuss two and three-dimensional art and explore the concepts and context of the work through creative processes, such as writing and art-making. The education team works with teachers to design tours that address specific classroom goals and standards in art, writing, science, social studies, math and more. The Art Museum provides in-depth learning opportunities for university and college classes exploring ways to use original art, artists and scholars as resources for research. The education team works with faculty to design classes and tours that are tailored to meet the needs of individual groups. Faculty are also encouraged to develop an ongoing partnership with the museum in order to access additional resources and support for classroom goals. Set up a tour for your university or college class or to discuss partnership opportunities. Family tours are great way to introduce children to the joy of discovery and the intriguing world of museums. With a little planning, families may schedule their own tour with a museum docent who will engage viewers of all ages in explorations of the artwork and the artists on exhibit. This includes age-appropriate activities and discussions. Consider scheduling a museum visit prior to a sporting event or as part of a family reunion. Community organizations are invited to participate in a variety of interesting and educational tour opportunities throughout the year. Art Museum docents are available to share background information on exhibitions that change every semester, providing viewers with fresh – and sometimes surprising – insight on the artists and the artwork. Groups can also learn about the building itself and how architect Antoine Predock made connections between the surrounding landscape and the Centennial Complex, which houses both the Art Museum and the American Heritage Center. A visit to the Art Museum is also a great activity for conferences. The Museum Tour Program is made possible in part by the Wyoming Arts Council through the Wyoming State Legislature and the National Endowment for the Arts, which believes a great nation deserves great art.